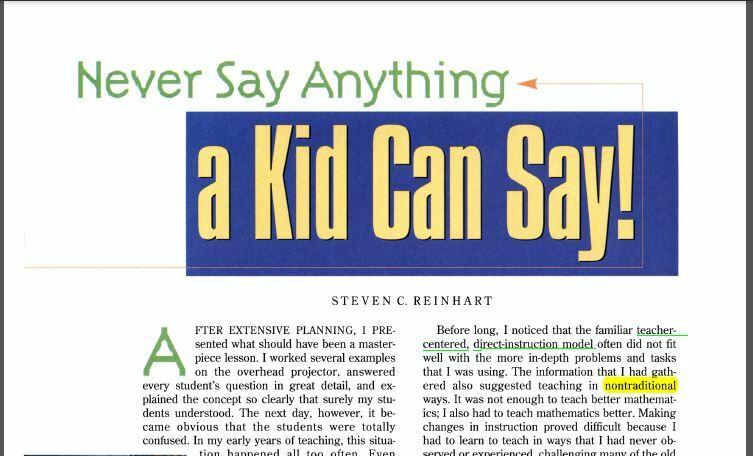 For this assignment, I read an article titled “Never Say Anything a Kid Can Say.” What an interesting article!!! I highly recommend it if you’ve never read it. It’s about a teacher… well, just read my review of it below! My professor gave me a grade of 98%, docked due to grammar errors. She also pointed out that my statement that it’s impossible to answer a question passively is not necessary true. Some children answer questions without really giving them thought. Answering questions actively is indeed a skill that can be improved with practice. So, I clarify: Questions are much less likely to be answered passively. Reinhart (2000), a teacher of upper-grade mathematics, was utilizing traditional teaching methods to the best of his ability, and yet his students were struggling. He discovered that the problem-solving avenues of his students’ minds blossomed when he began talking less and instead focused on using questions, hands-on learning, and, most importantly, class discussions. Reinhart’s new approach can be generally labeled as active education. More specifically, the advice that Reinhart shared for effective classroom discussion, questioning, and teaching as it applies to mathematics can be summed up as follows: “Ask the best possible questions” and “apply strategies that require all students to participate” (Reinhart, 2000, p. 479). Reinhart found that his students learned best and enjoyed learning most when he took the role of an overseer and guide and allowed them to form, develop, and fine-tune their knowledge through verbal expression and hands-on experimentation. An analysis of Reinhart’s article in light of the research from other sources presents clear evidence for the effectiveness of an active education involving problem solving, dialogue, and experimentation. Reinhart’s article is written as an analysis of his personal experience, on which he bases his advice. One must look to outside sources for the reasoning behind the effectiveness of the active-education method. First, Reinhart (2000) advised teachers to refrain from the urge to lecture their students, but instead to restructure their lessons into open-ended questions and opportunities for class discussion that would actively engage their students’ thinking. He also gave tips such as not rephrasing what students have said, not speaking for them, and not answering one’s own questions. Kauchak and Eggen (2014) describe the process of using effective questions to develop each students’ individual understanding as guided discovery. They stated, “When using guided discovery, you spend less time explaining and more time asking questions, so your students are more cognitively active and involved than in more teacher-centered approaches” (p. 369). Within proper framework and under the guidance of the teacher, a problem-solving approach that utilizes productive conversation “can lead to effective learning” (Schunk, 2012, p. 268). Reinhart’s methods worked because it is nearly impossible to answer a question passively, without engaging the brain. Secondly, in order to encourage and mandate whole-class involvement, Reinhart (2000) used engaging group activities where students, instead of merely copying a teacher when told how to solve a problem, experimentally discovered often multiple ways to solve the problem on their own. He gave teachers tips for insuring individual participation in group activities, such as having students work on the activity individually to begin with, before forming groups to complete their work. He also stipulated that he would not move on until all students had a correct understanding of the topic. Schunk (2012) cites research which shows that students who verbalize the problem-solving process as they act on it often have a much easier time solving the problem. This shows the link between speech and enhanced understanding, which is why it is so important that all students participate in the class discussions. Research and credible sources validate the soundness of Reinhart’s innovative methods of active education. Learning is facilitated and solidified much more effectively when actively involving students through dialogue and hands-on problem-solving. Reinhart (2000) formulated a method of education where he actively involved students through class discussions, hands-on mathematical experimentations, and effective questions with teacher facilitation. I really resonated with Reinhart’s position because I am a firm believer in active education. All that passive learning accomplishes is the ability of students to (hopefully) remember the knowledge of someone else. Students do not truly own the knowledge until they have become active participants in forming it. I agree with Reinhart (2000) that lecturing is basically “the transfer of information from the notes of the lecturer to the notes of the student without passing through the minds of either” (p. 480). As a Christian, I believe that humans were created by a God of logic and order Who endowed each individual with a certain extent of reasoning ability. “’Come now, and let us reason together,’ says the Lord” (Is. 1:18, New King James Version). I believe that teachers do students a disservice when they attempt to spoon-feed knowledge to them instead of teaching them to think for themselves. Engaging students in educational conversations causes them to speak their ideas aloud and be questioned and respectfully challenged by the ideas of others, thus solidifying and shaping their own understanding. In my opinion, Reinhart’s method embodies the true definition of learning: the formation of personal knowledge, which must be an active, not passive, process. Kauchak, D. & Eggen, P. (2014). Introduction to teaching: Becoming a professional. Upper Saddle River, NJ: Pearson Education, Inc.
Reinhart, S. (2000). Never say anything a kid can say! Mathematics Teaching in the Middle School, 5(8), 478-483. Schunk, D. H. (2012). Learning Theories: An educational perspective. Boston, MA: Pearson Education, Inc.
Next PostNext The Finish is in Sight!